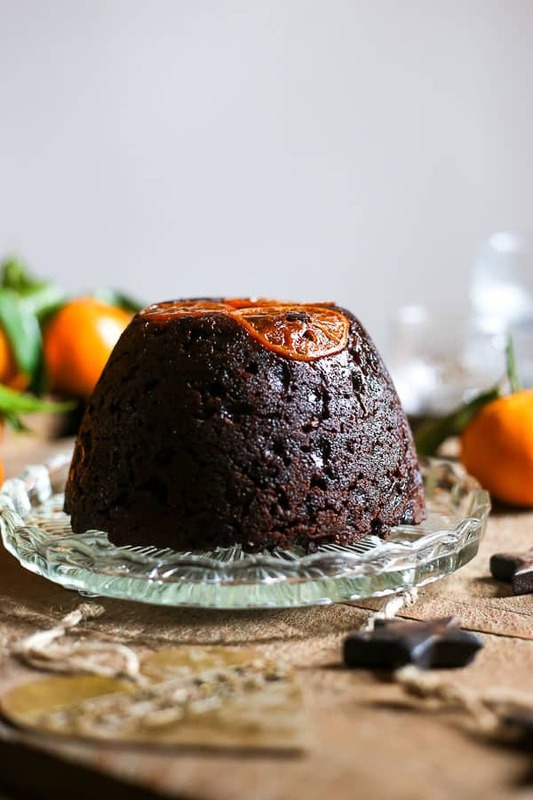 This Gluten-Free Traditional Christmas Pudding is bursting with plump luscious fruit. It’s a light and fluffy pudding which won’t weigh you down at the end of your Christmas banquet. 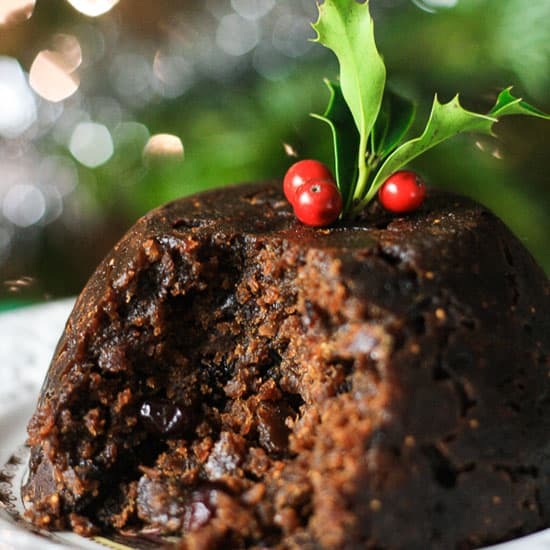 I know it’s incredibly late in the day to be posting a Christmas pudding recipe. If you have your wits about you your pudding will have been done and dusted on stir-up Sunday which is traditionally the last Sunday before Advent. This is when the Christmas puddings, mincemeat and Christmas cake would usually have been lovingly prepared by the cook of the family. Each family member would have then taken a turn to stir the Christmas pudding whilst making a wish. It’s all very Mrs Beeton. Or if you are even more with it then you might have made your pudding back in the spring to give your little guy a chance to mature at his leisure over the course of the year. Yes, it is lovely to be organised and forward thinking but if still haven’t quite gotten around to making your Christmas pudding and are worried that you have missed the boat and are now contemplating plonking one of Heston’s clementine centred lovelies in your shopping trolley, then please be reassured that it isn’t your only option. There is nothing wrong with making your pudding a few days before the big event. Okay, so it won’t quite have reached the maturation you might have liked if you had done it earlier but I guarantee it will taste better than any made by a supermarket’s factory. 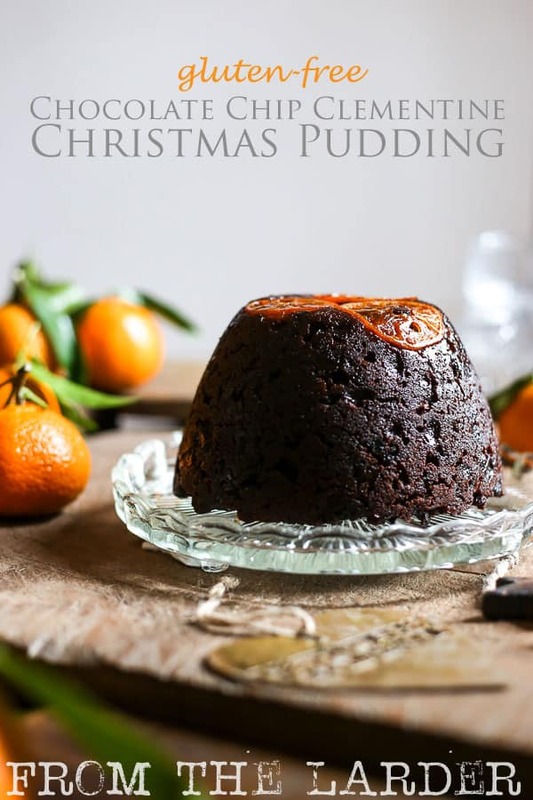 However, if you’re not sure or you have already got your pudding ordered from a local bakery there is nothing stopping you making a Christmas pudding anyway and then saving if for next year. If you do, you won’t regret it. A good Christmas pudding will keep and keep and keep and for the first year just get better and better. It is also not necessary to feed your pudding with brandy or rum or whathaveyou during its slumber. 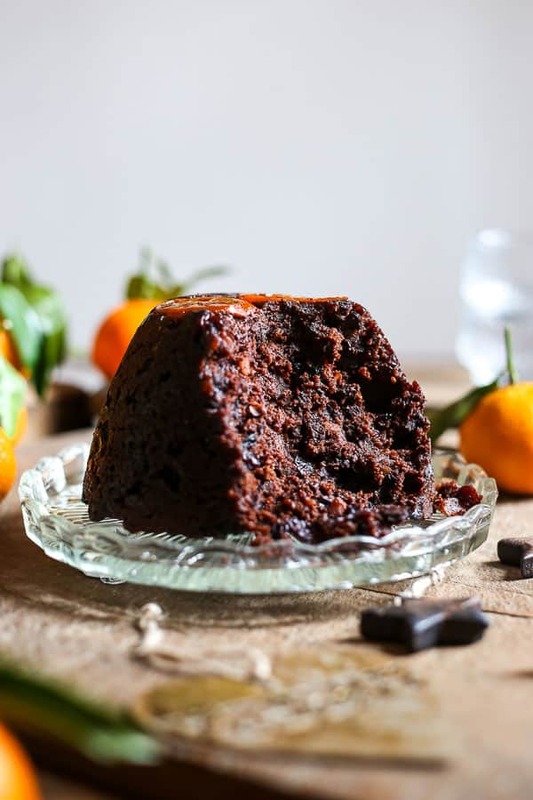 A Christmas cake yes but a Christmas pudding no – there is enough fruit, alcohol and sugar going on in there already to keep your pudding nice and moist for at least a year (or possibly two if you’ve really wrapped it up well and kept it somewhere cool, dark and dry). 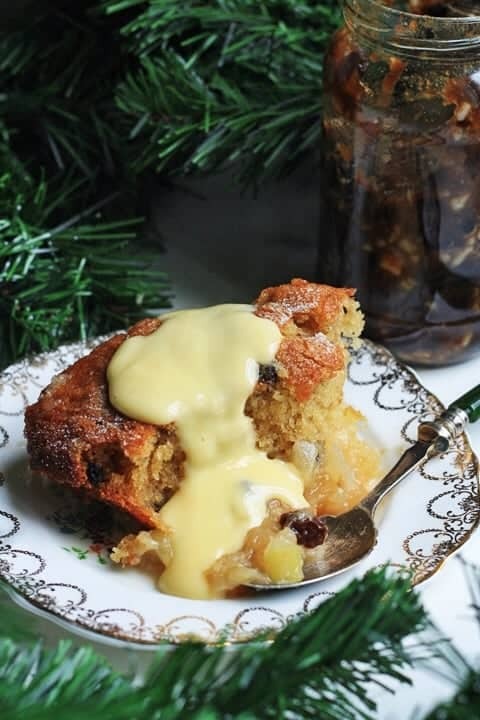 I love Christmas puddings; making them, watching them for the days, weeks or months they are kept and then the ceremonial eating of them – scorched with brandy and doused in a hefty amount of brandy laced white sauce. I remember the white sauce from school. It wasn’t anything we ever ate at home as I think we always had plain vanilla custard or cream. I can still taste the school’s Christmas pudding and white sauce so acutely though. There was usually a foil wrapped penny nestled within the dark fruits so of course the whole affair was imbued with a metallic flavour which I think rather fondly of. When I was young my Auntie Lil made every Christmas pudding in the family and hers was unrivalled. 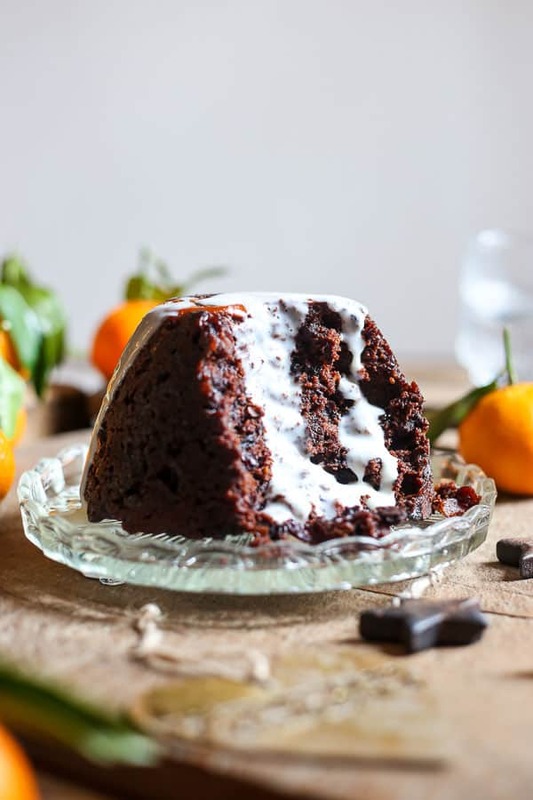 When I reached my twenties and would relish any chance to bake I asked my mum if she thought Auntie Lil would mind if I made the Christmas pudding that year. My mum replied that she thought it might be a relief to my ageing Aunt to cater for one less. However, despite my pudding turning out relatively okay, thanks to Delia’s impeccable instruction, a Christmas pudding and a box of mince pies was dropped off anyway from my Aunt whom obviously wasn’t ready to hand over the pudding baton quite yet. We ate quite a lot of pudding that year. Good times. The Christmas pudding is a bit of a labour of love as you need to mix one set of ingredients one day, add some more the next, steam for a few hours then wrap up and leave until Christmas Day, whereupon you need to steam it for another few hours. 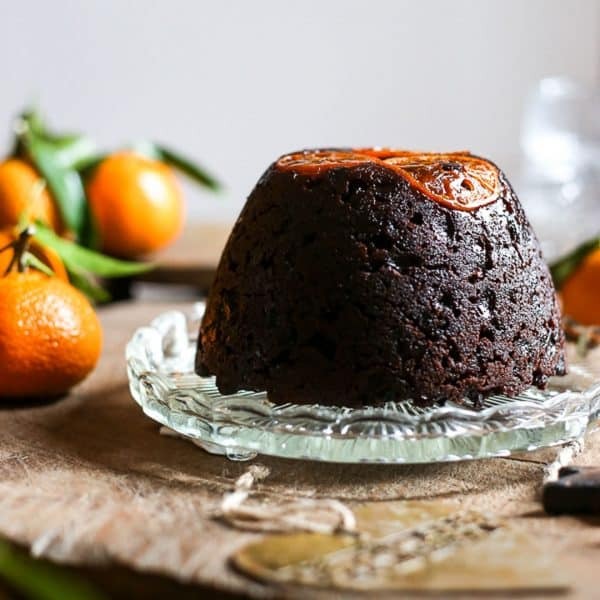 Don’t be tempted to whack it in the microwave after you’re stuffed with turkey and sodden with festive wine to bring it up to temperature, it is important that it is steamed once more so all the fruits grow plump and luscious within the pudding again. The finished pudding should be bouncy and light but rich with flavour. The microwave will zap your pud of life and render it a solid lump of claggy fruit. You’ve been told. I’m particularly proud of my pudding, I’m sure it started off life as a Delia affair as she really is the doyenne of Christmas food prep but over the years I have subtly altered it to make it a little lighter. I added figs at one point as I had them in one year and never looked back and then another year I added dried cranberries, then grated carrots until this one printed here became my permanent and final recipe. Toss all of the ingredients from Day One together in a large mixing bowl then cover the bowl with clingfilm and leave in a corner of the kitchen to marinate overnight. Add all the ingredients from Day Two;to the marinated fruits from Day One. Stirring everything together thoroughly with a wooden spoon. It is tradition to make sure every family member has a turn to stir the pudding and make a wish as they do so. Butter two pudding basins, one of 950g and one of 450g then fill each with the pudding mixture leaving at least one inch of room from the top. Take a piece of greaseproof paper and lie a piece of foil on top, make a fold in the centre of both pieces which allows for more room for the steam to rise. Place these over the top of the large pudding basin, with the foil on top, securing with string around the pudding. Trim off any excess paper and foil, you don't want them to hanging too low as otherwise they will soak up the water during the steam. Repeat with the smaller pudding. Place a wire rack (or a folded up tea towel) into a large lidded pot, deep enough to cover the puddings (you will probablyneed to use separate pots for each pudding). Then place the puddings on top of the rack. Fill the pot(s) up with boiling water until halfway up the pudding. The water should not touch the greaseproof paper or foil otherwise they will soak it up and the pudding will go soggy. Place the lid on the pot(s) and turn the heat on so the water is kept at a simmer. Steam for three and a half hours, checking the water level occasionally and topping up if necessary. Remove the puddings from their pots then if you wish you can re-wrap the puddings in fresh greaseproof paper and foil and store in a cool dark place until Christmas Day. 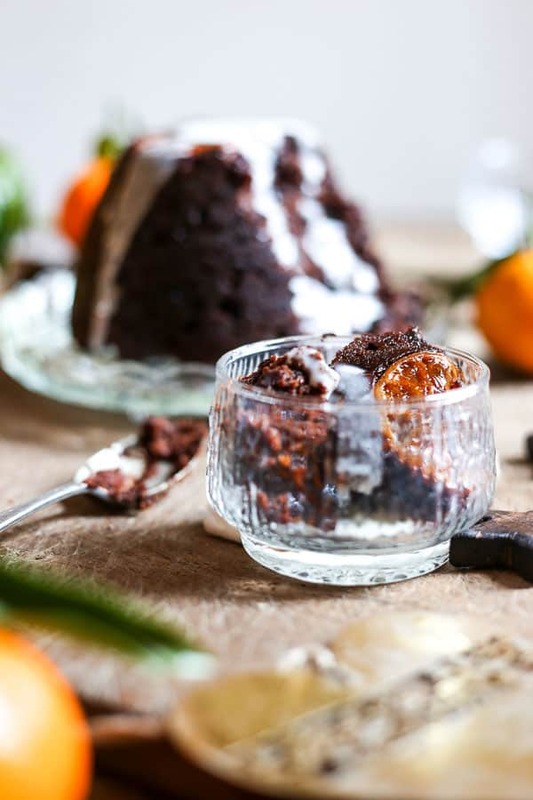 It is tradition to keep your puddings under the bed but if you have a Billy Buddy like us then you might decide that a kitchen cupboard or larder is a better option. On Christmas Day the puddings will need a final steam before serving so repeat steps 6 and 7. However your puddings will only need two and half hours this time. Turn your pudding out onto a plate and serve aflame with brandy butter, custard, ice-cream or my favourite - brandy laced white sauce - to accompany it. Commercial suet is coated in wheat flour. I haven't found gluten-free suet that easy to come by but if you order fresh suet from the butcher it will come in a block and you can grate it with rice flour to create suet which will evenly distribute throughout the pudding.